Here are the chickens. One pullet is hiding, they’re still establishing the pecking order. But the rooster seems cocky! We bought two Rhode Island Red pullets and one full grown rooster. Arlis wanted the rooster. I don’t know, I guess it’s a man thing. We were going to get a rooster anyway…but… We’ll add more as time goes by and breed our own, replenishing the genes with a new rooster every so many years. We wanted some now for eggs. The rooster is named George after the one in Grace and Favor or Are You Being Served Again. We’re not naming the girls. The hay came from our field. 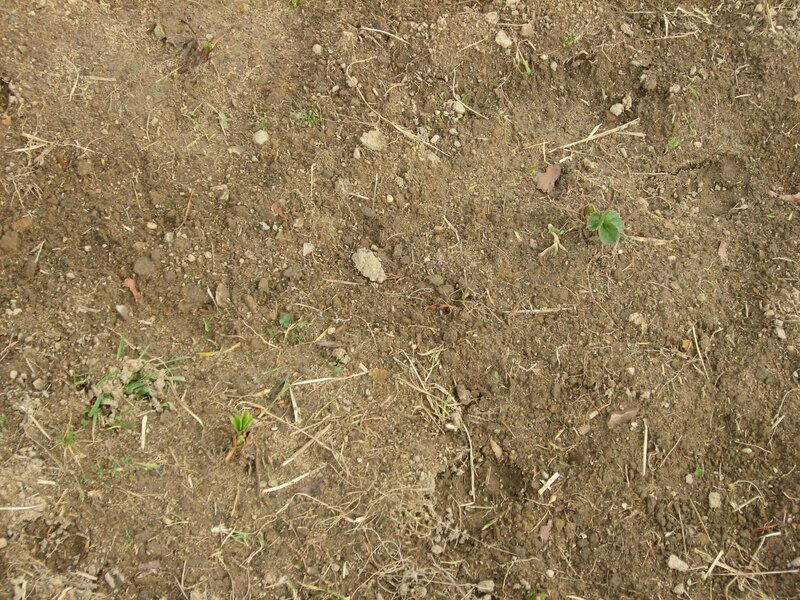 It was just lying about, so I raked it in piles with a garden rake and Marcus put the piles in the wheelbarrow. It was a few loads, less than ten. We’ll add more after the chickens have moved it around a bit. That’s the new door. The swings were the kid’s idea. 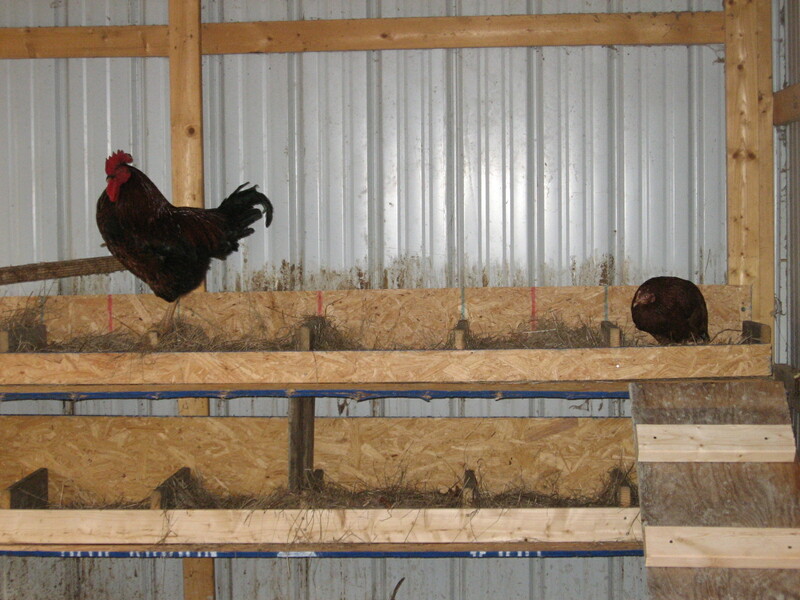 I’ve heard of roosters using and enjoying them, so I said “go ahead.” That’s the new door Arlis built. We also cleaned up the run, but it’s not completely secure yet, so they’ll stay in here a few days. Arlis has also been busy upstairs, so-to-speak. 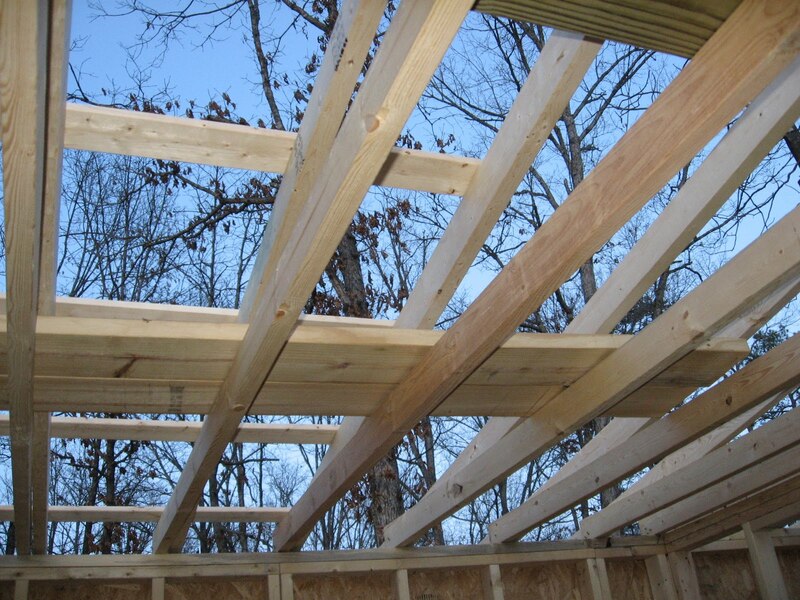 He closed up one end, put up ceiling beams, added a few rafters, and secured a few with lathe. 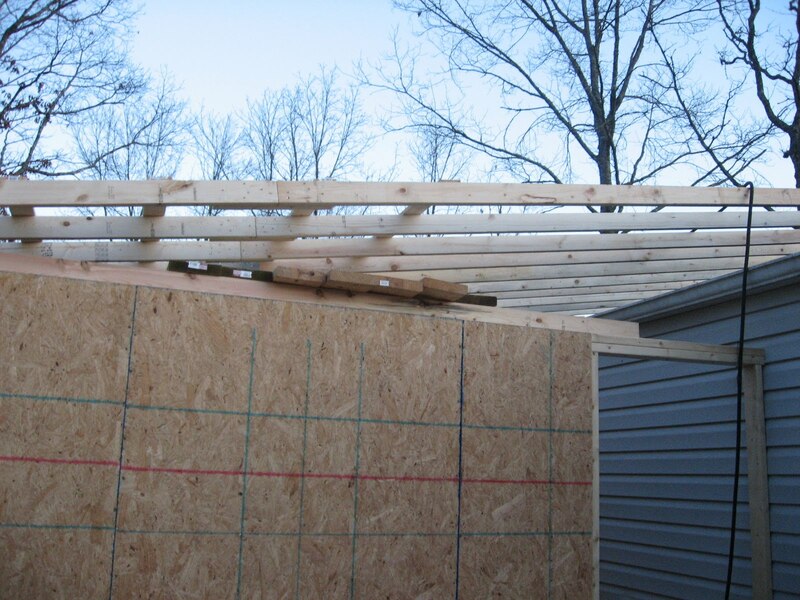 He also finished making all the rafters necessary for the roof…supposedly. We’ll be ready for the metal soon!! Then we can move some more from the shed and not have to make as many trips as often. 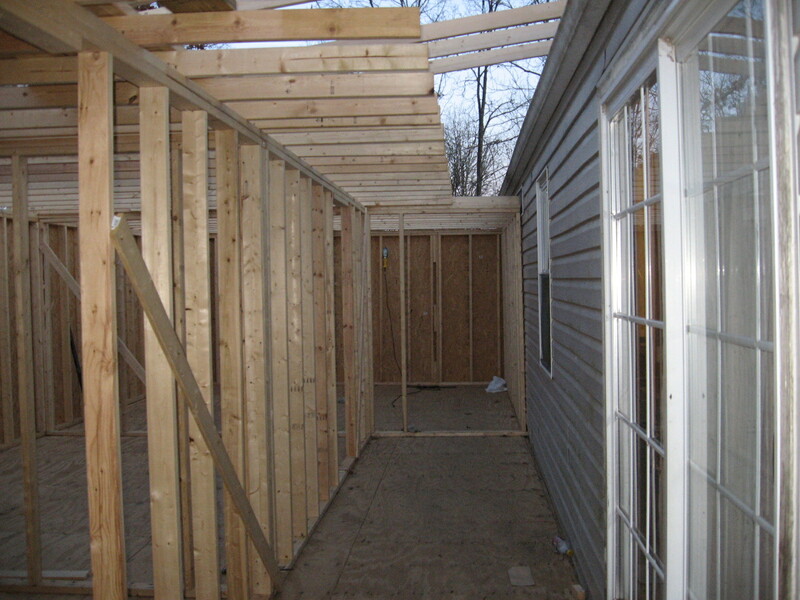 Wanted to wait until we got more room built, but I didn’t. We have 16 strawberry sprouts (so far out of 25). The blackberries are all happy and with new growth. 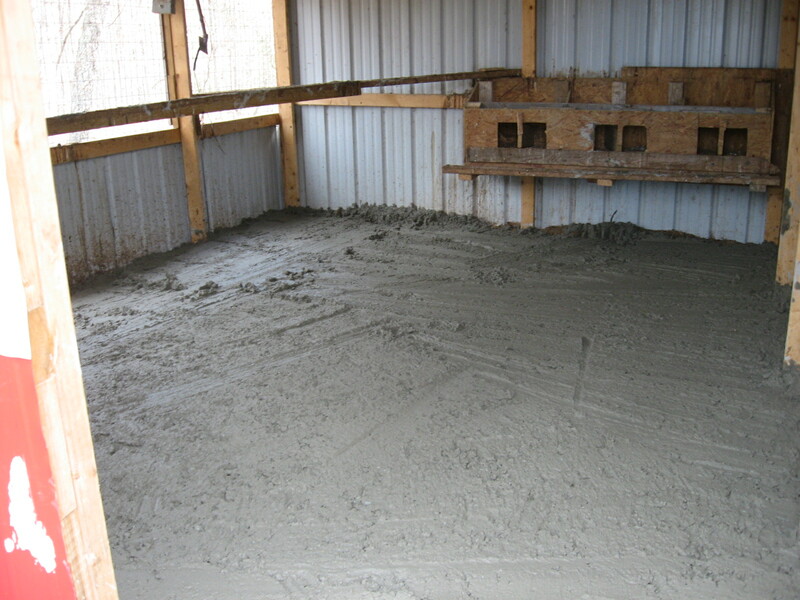 The chicken coop has concrete. More work has been done on the rooms, but not a lot to write about. Nesting boxes have been made. The run is finished. 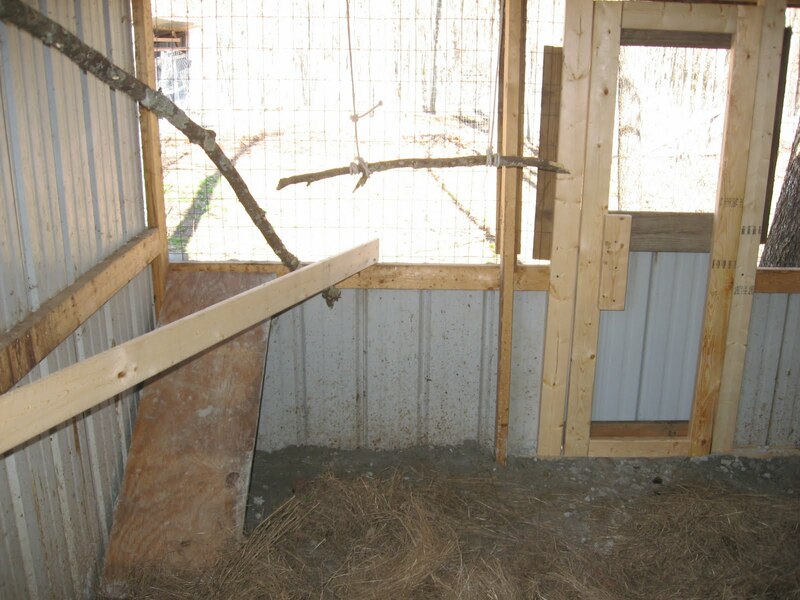 A door is being built for the other side of the coop to go out to the run. We have a drum for burning trash and is STAAAANKS!!! We got this a little smoother, but left it a little rough on purpose. The middle is humped up for drainage, and the rest is rough in order to prevent slippage and to make the chickens feel more like they’re outside. 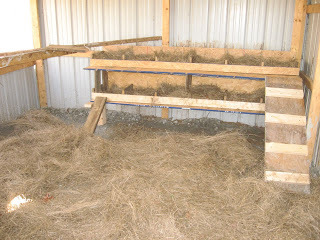 (and if you believe that…) Those nesting boxes will be removed, and new ones put in. Three of the six blackberries. Three or four strawberry sprouts. So far, everything is going well! 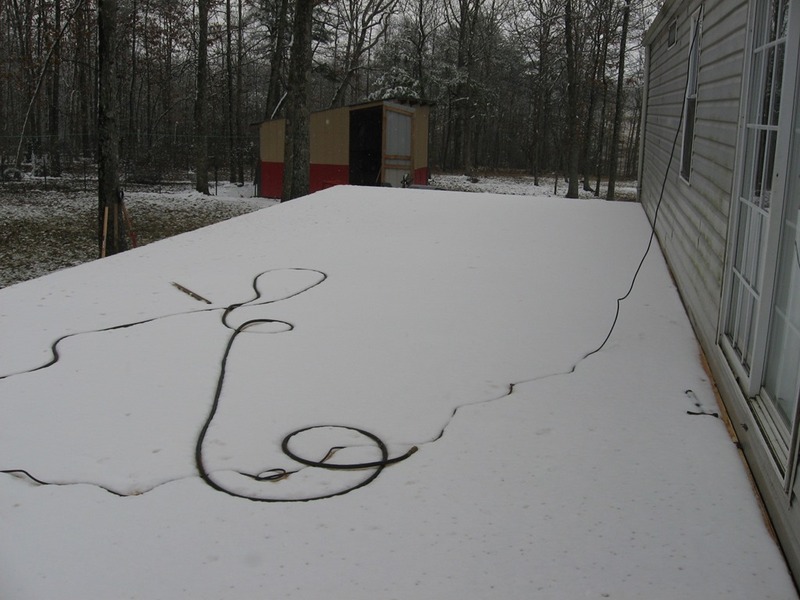 I’ll write soon with advances on the addition to the trailer/house, but I couldn’t wait to send this. 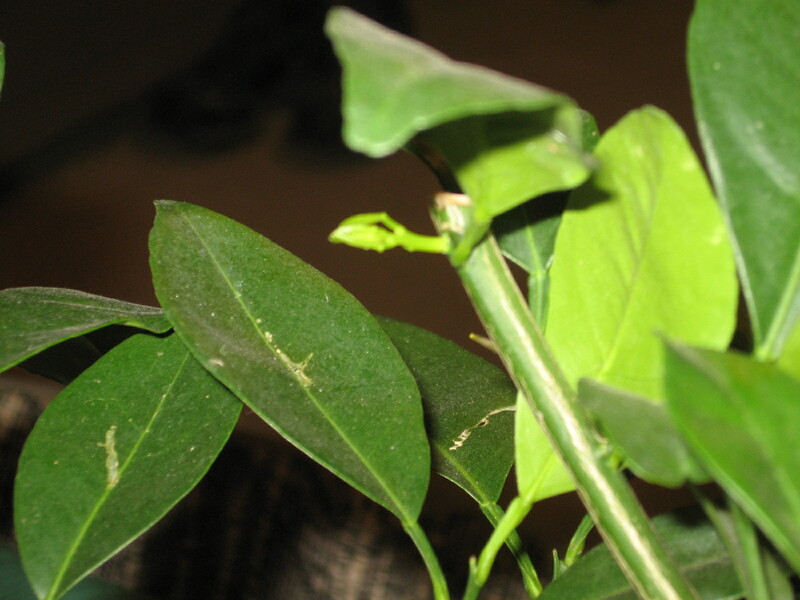 I must be doing something right as my orange tree has a new bud!!! (and it’s bigger than it was yesterday) I’m so excited! Too me, it’s just too cool to grow something exotic like oranges in my own house! We are going today to buy some more from Lowe’s. The truck is now running, and we were able to take our first trip to the dump. Marcus is finally getting used to homeschooling and to the area a bit. He’s excited about next year’s books that are coming in the mail, and he enjoys being able to play outside again (not to mention without constant supervision, too many rules, and constant fear from his mother of something bad happening). So, things are going up. We have also cleaned out the coop except for some final sweeping, and have decided to pour concrete over the OSB for….oh so many reasons. It’s supposed to rain the rest of the week. Dad’s here until it starts. I got him up with the sun claiming that daylight savings times starts this weekend, so he might as well get used to it-hee hee hee. Got a bit done yesterday. They had to cut a foot off the heights of all the walls due to pitch of roof or something. We also discovered that for $100 more or so, we can add…200? square feet. So, that’s why there are gaps between the walls. The gap to the left is being filled as I write. It’s the extra space. 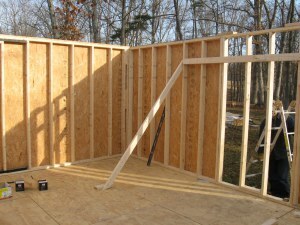 Arlis had already pre-built the walls in the shed, that’s why the gaps are here. The gap to the right is the left gap from the pic above. 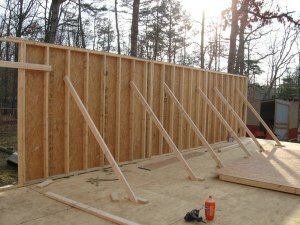 The left wall above is the wall below. The gap here is the added space as well. We added both length and width. 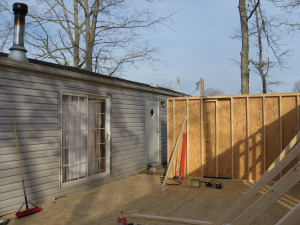 The sliding doors will be gone, and the outer door will still open to what is left of the deck. The chimney will be moved to the addition part and the new stove installed in order to get insurance coverage. (Gotta love red tape! How stupid can you get?) They hope to get all outer and inner walls before the rain hits. I think they plan to pre- build rafters in the shed. You’ve heard of rednecks having transmissions in their bathtub…well. You might be a …insert adjective here…if you’ve ever had trees in your bathtub. The orchard is planted, save the plants awaiting warmth. However, I didn’t notice that I used hot water, not cold. Still trying to figure that out. Arlis mentioned it within about 5 seconds of filling the tub. I run and drain it all and fill with ice cold water. OOPS! These are the blackberry and orange. 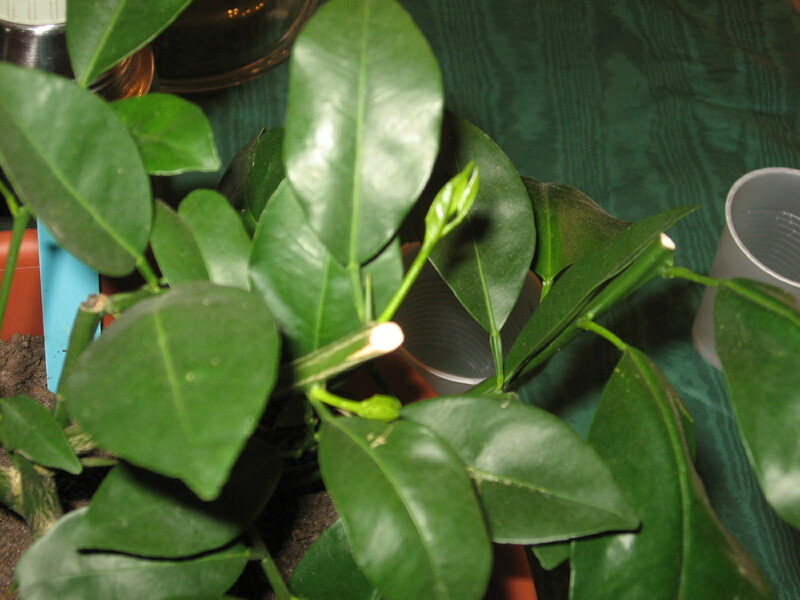 The orange is specifically designed to be potted indoors during bad weather. We have a similar banana tree coming later. The strawberries are in the fridge awaiting good weather, and the other trees and raspberries are on the deck in a box dormant, awaiting their frozen holes in the grounds. 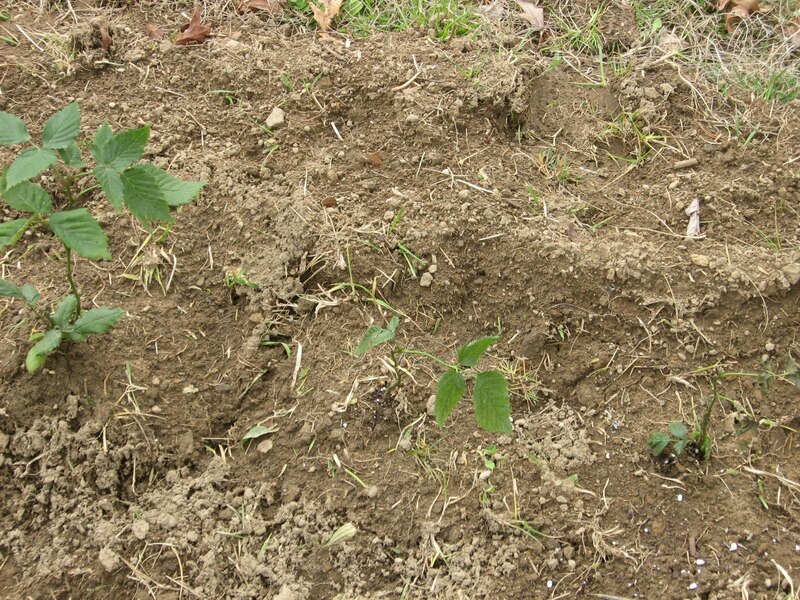 The blackberries will have to be hardened off and then planted when warm. They will replace trees that don’t do well, and they have an excellent catalog that tells you everything you need to know about the plant. Their customer service is PAR NONE at helping the completely ignorant in planting their trees/plants. They also have decoratives and oddities. I always wondered why people made such a fuss over tomatoes. They plant them over a month before putting them in the ground and go on and on about them. I still think it’s over done, but I see some of the reason now. I also wondered why everyone loved growing cucumbers. I was used to gourds, watermelon, corn, and a few oddities. Strong plants, slow plants. 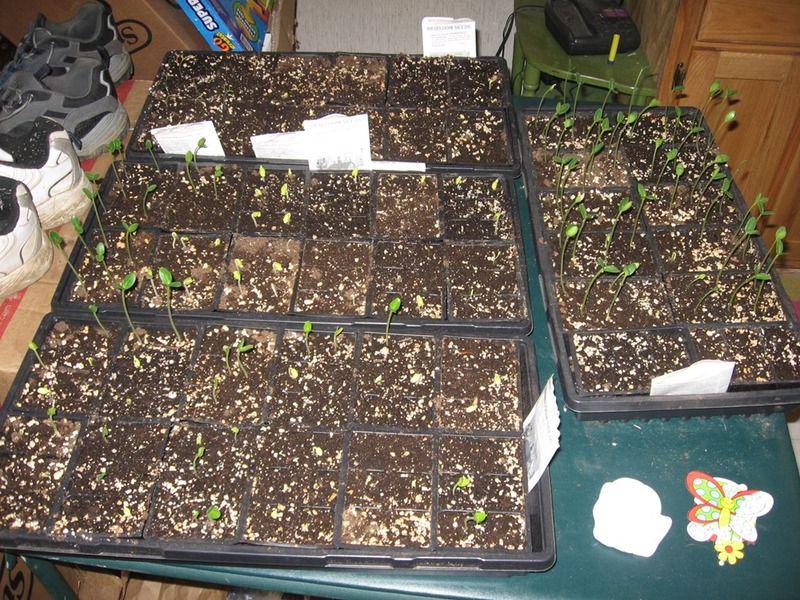 When the poor little tomatoes finally sprouted, I was afraid to breathe near them! They look so fragile! The cucumbers (I’m still not enthusiastic enough to call them cukes) have GROWN and QUICK. I finally have a few watermelons today. I’ve had to rotate the trays to keep them as straight as possible. Here is from this morning-day eight. The tall are cucumbers, the light green in the middle are okra, and the teeny ones top left are tomato. Watermelon is top center and barely able to be seen. I’m sorry you can’t see them too well, but you get the idea. There are a few tomatoes with the okra. Gee-it snowed again. It’s mostly melted now. I just took this picture. The floor is done as far as I know, and dad is here. I thought they were doing walls today, but that information must be on a need to know basis.